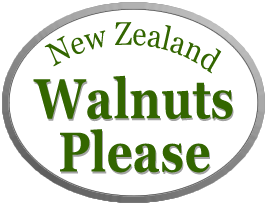 This page is about New Zealanders who grow walnuts commercially. Not exactly an orchard story. Well this is not exactly a walnut orchard story but these are walnut orchardists. Members of our group are enjoying dinner at Two Fat Possums restaurant at West Melton near Christchurch. Caramelised Walnut and Roasted Beetroot Salad was on the menu. It’s amazingly good. Here’s our recipe. NutZino – An intriguing liqueur made from New Zealand Walnuts. Is this the first time that you’ve read about this hearty aperitif? NutZino is a walnut liqueur based on a Northern Italian traditional after-dinner liqueur. As with many European liqueurs its history dates back thousands of years, to when the Celt’s dominated central Europe. The Celts are thought to have originally introduced this drink and its production is connected to ancient legends and superstitions. It is known for its distinct yet sophisticated flavour and very special aromatic characteristics. It has been proposed as a tonic and digestive aid, and recent scrutiny has explored its high phenol content and antioxidant properties. NutZino is produced in Canterbury by Ian Sheerin and Leo Vanhanen. Ian and Willy Sheerin have spent many years developing a 15 acre Walnut grove with some of the most diverse and mature commercially productive Walnut trees in Canterbury. Leo is currently a Food Scientist at Lincoln University and has many years experience as a Winemaker (12 vintages). Together Ian and Leo have crafted a local version of this traditional liqueur called NutZino for your enjoyment. Created from years of work, you will find it has a distinctive flavour and bouquet. You can find out about where to buy NutZino in the South Island Section of our buying walnuts page or at the NutZino web site. This family look to be quite at home during the 2017 harvest. We wonder who picked up all the walnuts in the big box? It’s possible! Walnuts can be shifted using an auger? Here Clive Marsh inspects nuts from the crop that he and Heather North have grown. He is making sure the walnuts aren’t getting crushed while being shifted by an auger from a large grain silo into a drying bin. They moved about 12 tonnes by this method. Sigmund’s Orchard showing their shed with walnuts on the ground ready to harvest and a large push harvester in the foreground. Big Walnut Harvester. What a whopper! Did you believe there would be a walnut harvester this big in New Zealand? There is, and it’s on Margaret and Frank Brenmuhl’s orchard at Aylesbury near Christchurch. Thinking About Machinery? Frank and Margaret write “when we purchased our 32 ha property in 1996 we were blissfully ignorant of the machinery that we would need by 2015. For our first harvest in 2003 we used hand rollers and a variety of iterations of washing machinery and air drying racks”. Now we’ve got the big harvester, washing and drying equipment and a tree shaker, and it’s all necessary. In 1998, Ngaire and Tony bought ten acres of bare land at West Melton near Christchurch where they have established a beautiful home and tidy attractive property. Between 2000 and 2002 they planted over 400 walnut trees. The majority of the trees are grafted Rex and Meyric types. They also planted trees called G120s, G139s, 157s, Stan and Tehama so they produce a bigger variety than most orchards. The trees were pruned to a single leader with branches every 300mm to 600mm. Tony says that was the theory anyway but other members of the Walnut Group notice that the Sigmund’s trees have very good form and shape so we think that Tony knows what he’s doing. The two biggest problems are frost and walnut blight. Sigmund’s don’t do anything to prevent the frost damage, but they do spray for blight from October to December. Ngaire and Tony harvested their first walnuts (60 Kgs) in 2008. Since then they have approximately doubled their harvest each year, except 2012 and 2014 when they were hit really badly with late frosts. The next milestone will be a season that produces 4 tonnes of walnuts. Depending on the weather and their own energy levels of course. The orchard and the new walnut shed have proven to be a great playground for their family and grandchildren, especially in the warm summer months.